The hubs are two of 11 to be created nationally and will benefit from a share of the £21m earmarked from the expansion of the Tech City project. The announcement came as Philip Hammond announced £500m of investment would be used to increase the development of Artificial Intelligence, as well as 5G and full fibre broadband. The new Centre for Data Ethics and Innovation would be created to work with government, regulators and industry to “lay the foundations for AI adoption”. “The world is on the brink of a technological revolution,” Mr Hammond said “A new tech business is founded in Britain every hour. And I want that to be every half-hour. So today we invest over £500m in a range of initiatives from AI to 5G and full fibre broadband.” Martin Port, founder and chief executive Leeds-based technology start-up BigChange, said: “We welcome this announcement and support for tech businesses from the Chancellor. 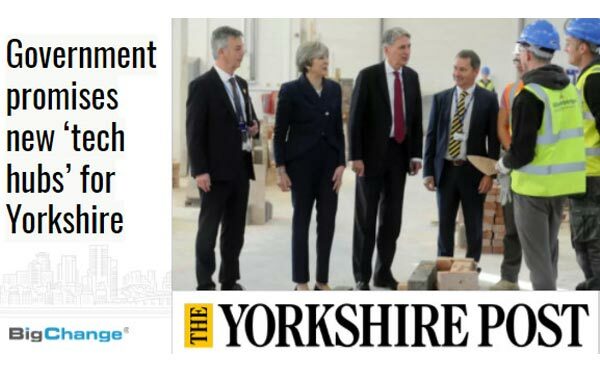 “Financial backing and stability is a huge hurdle facing all start-ups, so I am pleased to see the government pledge more than £20bn of new investment. “I just hope this funding is easy to access and readily available for those who need it, rather than being hidden among reams of red tape.” AI has become increasingly prominent in mainstream technology, with many of the popular gadgets such as the Amazon Echo powered by the technology. However Richard Parris, chief executive of digital firm Intercede, warned that a lack of investment in cybersecurity was a crucial issue that still needed addressing.